Posted on Friday, July 6th, 2018 at 9:14am . The most important thing to know about real estate agents is that you have a choice. You can ask for recommendations from friends or family, you can read online reviews, but at the end of the day it important that you make time to have a few conversations and interviews with the agents that might best be able to serve you. Ask questions, find out more about them and their business, and don’t be afraid to keep looking to find the agent who sounds like they will be the best fit for you or your family. 1. Have you worked with military relocations before? It may seem obvious, but make sure they have been through the unique PCS process before. Although someone is an agent in a military community, there are plenty of homes sales in the civilian sector, and they may not have had any experience with the quirks of PCSing. Ask for some examples of obstacles they had to overcome in past PCS moves and get a feel for the way they handle them. 2. Do you belong to any professional organizations? Just like any other career path, there is an abundance of professional organizations and special designations that agents can train in, earn, and be a part of. Find out if they have any designations that may benefit you. And while it’s not mandatory that a good agent has any special certifications or be a member of any organizations, it does show a commitment to furthering their involvement and education as a professional. 3. Are you comfortable communicating in different ways? An agent friend of ours recently helped a family PCS from Japan to Virginia. There were some challenges with the move, and the abundance of time zones between the two places didn’t help. There was a lot of email and text communication and even some video walkthroughs the agent made to give them tours of houses before they could physically make the trip. It was tough but incredibly rewarding. The point is, there can be some communication hurdles, but if you find an agent that communicates in a way you are comfortable with then you have a winner! 4. Are you familiar with the area around the installation? Again, it seems like this might be a given, but there are some answers you will need when finding houses that only someone who is familiar with the area can help you with. You’ll need to know about traffic, what it’s like, and how far of a commute you might be making in miles and time. 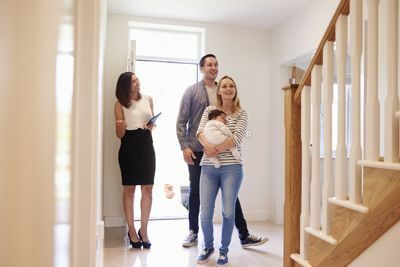 Even if you don’t purchase directly around your new installation, there are still resources on the base you and your family will need to access, so knowing how far you might have to drive can help you figure out if a town or neighborhood is worth it. And although it isn’t mandatory, it’s always good to know what your nearby amenities are, and that knowledge is something a good agent can share with you. If you’re on the hunt for an agent, make sure you check us out at PCSmoves.com. We strive to connect the men and women who serve with agents that meet their unique needs. Check us out and start searching today!